Brought to you by Graham and Daniel; your favorite residential small boat coxswains. Nine weeks lapsed into four weeks which has now lapsed into two. Fourteen days left and we're still stranded in Savannah until at least Monday. Tragic. It’s looking like a straight shot to Puerto Rico from here. Generally, we look forward to port as a break from voyaging and a time to rest and explore a new place, but a guaranteed seven days here promotes our desire to get back underway. We want nothing more than to raise our sails for the last time together. Today was our second day stranded by weather and the educators had to get creative. 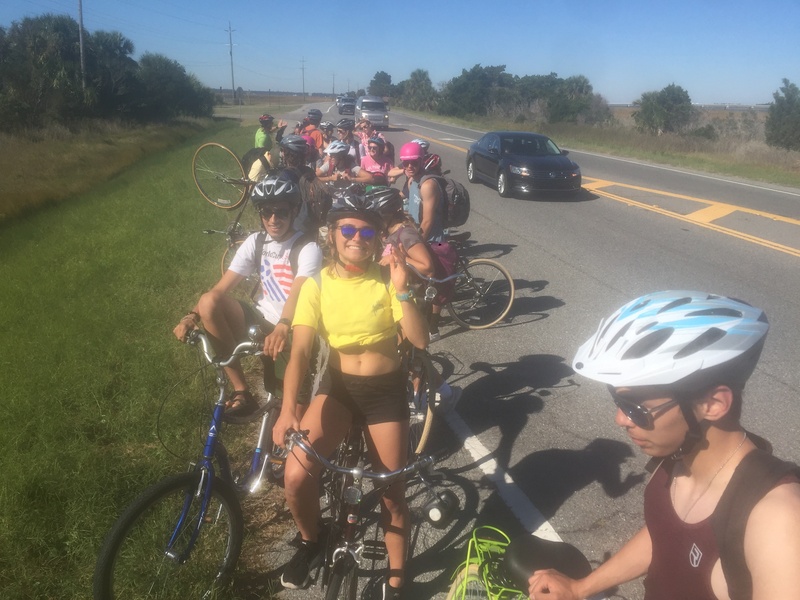 They rented us single-speed city bicycles and we rode them out to Tybee Island for a day at the beach. It was thirty miles round-trip and by the end at least five people had some sort of mechanical issue. Tommy’s wheel bent as his brakes were rubbing; Johnny’s chain snapped in half and my seat for some reason had a built in tilting mechanism that wouldn’t stop rocking back and forth. My inner thighs still ache. Otherwise, we had a good day together, hopefully one of our last in port. Fingers crossed that we’ll be Puerto Rico bound by Monday. After biking those brutal 30 miles, we all rounded up in town, bought ice cream, and finally caught the small ferry shuttle back to our home. After changing and setting up dinner, Brandon surprised us with a very tasty healthy salad and chicken dinner. Probably one of the healthiest dinners we have had aboard Roseway. As dinner started to wind down we were told we were allowed to go for a swim in the hotel’s pool. It was so warm compared to the air. Almost felt like a hot tub. Rumor has it our plan is to hopefully set sail for Puerto Rico on Monday. It’ll be nice to get out of Savannah and make it down to the tropics! 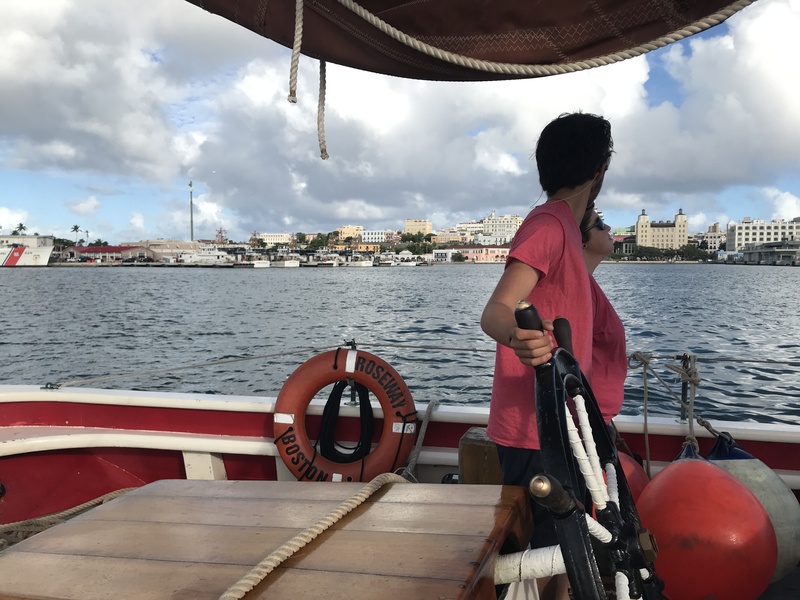 As the Roseway prepares for its long-waited transit from Savannah to the Caribbean, we reflect upon our past trials and tribulations as shipmates and family. This experience has been defined by the pursuit of excellence in seamanship, in schoolwork, and in community by a crew of dysfunctional, energetic, and determined students. 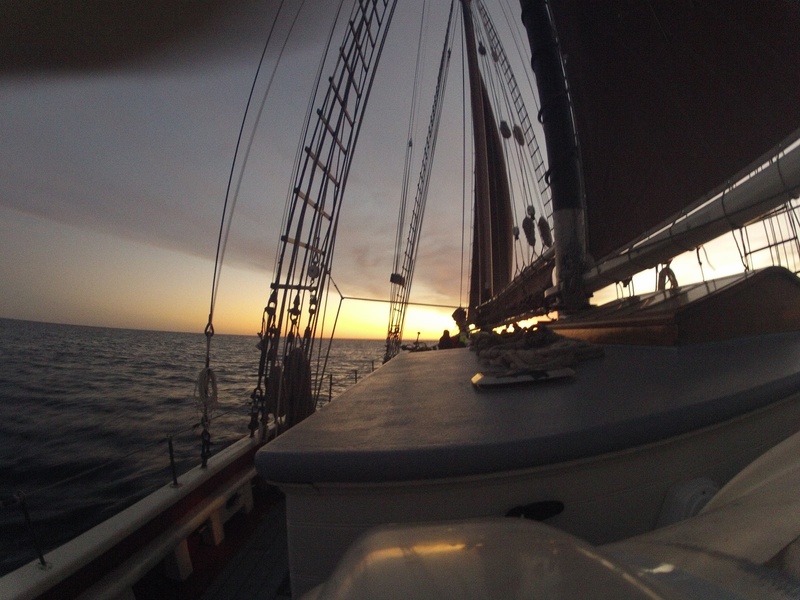 Take for example our constantly changing conditions aboard the Roseway. The life of a professional mariner is full of boredom, excitement, and occasional terror due to wind, rain, and seas. No matter the conditions, Johnny always plays guitar, AJ is always laughing, Tommy can’t stop singing; no matter the conditions the chariot rolls along. Even when seasick, the relentless crew continues to work on their sea shanties, adding humor to traditional nautical tunes. They are continuously learning about their abilities to overcome the very real obstacles that are constant on the ocean. Even conditions that are challenging to those of us that have been on the Roseway for a while, this motley crew goes about their work with gusto. 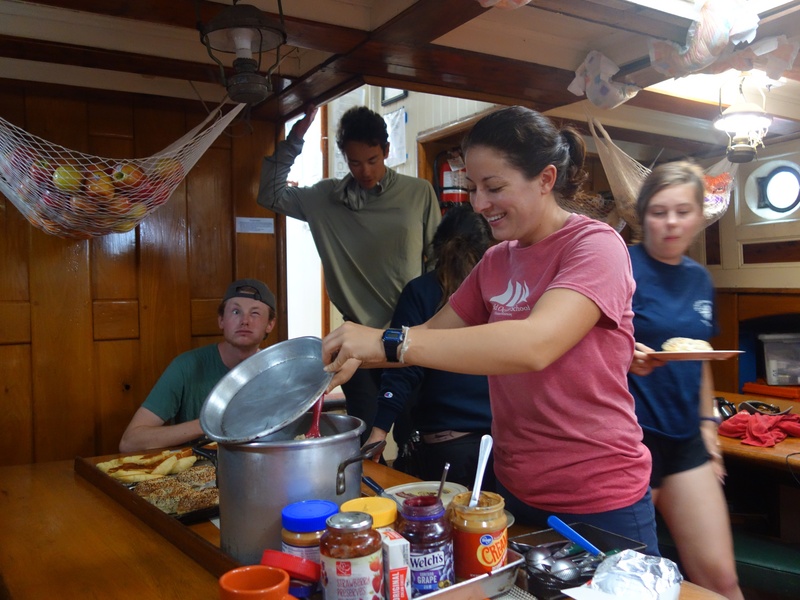 Scrubbing the soles (floors below deck) and bowls (toilets) at least once per day, charging the fire hose to wash the deck, and cleaning dishes, dishes, and more dishes, are just some of the tasks that make up a normal day at sea. We originally thought getting twenty high school students to get on their hands and knees to scrub would be a massive challenge, but like many other important aspects of nautical life we thought the students would have no desire to do, they are more than willing to attack chores, work, and whatever challenges are presented to them. 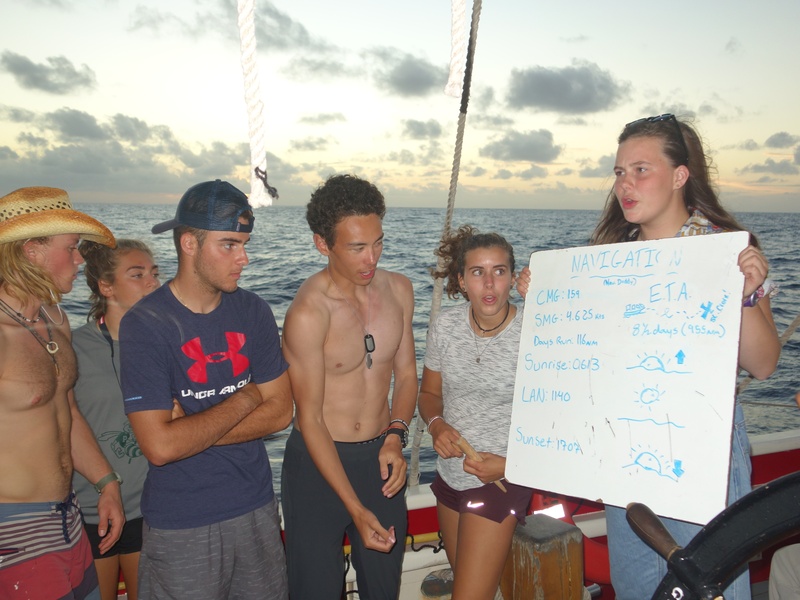 After the halfway point, the students got even more responsibility by becoming Junior Watch Officers, basically making us deckhands obsolete. The effort they put into their work waylays any fears we have about the final challenge they will face: the almost two-week voyage to the islands. All their work has lead to this final leg, and we cannot wait to see them continue to grow. Ah youth. At this point we are on our longest voyage to St. Croix. We have been anticipating this for 46 days. Casting off at the Westin was definitely bittersweet. I was relieved to finally be voyaging, yet sad because it’s our last stretch. As we sailed out of the Savannah River, the weather shifted from humid and foggy to down-pouring rain. All hands, we were hauling sails in our full foulies, such a wonderful start! But it was odd that we were hot rather than frigid. We no longer have to bundle up and sleep in our sleeping bags. It felt as though a cold front was following the Roseway all down the coast. This experience has been amazing and I cannot wait for the upcoming days- I just wish it would never end! We had an all hands call to haul up the main, and as we were standing there drenched to the bone with the rain seeping through our foulies, my hands were so pruned that they faded from a tropical tan to the saddest shade of white, but, they clung onto the halyard with fierce power as all our spirits were high because FINALLY we were off to sea. Watching the billions of rain drops meet the water made a group of us agree that we didn’t think there could’ve been this much rain. I had seen it pour, but not like this! Above the turquoise water in a 360∞ view, we felt as though there’d never be fair weather again because there was a filter the rain added onto the world as we had known it. Although tonight we were gifted with such glassy seas, that it looked as though the sky and all its monstrous clouds had its very own reflection. It was peaceful. We sailed for a while without any of the white noise of the generator or engine and no sounds of the city life that we were constantly hearing in Savannah. We sailed along the polished water finally at peace, with only sounds of the creaking ship, swinging boom, and waves hitting our hull and each other. We are happy to be in transit once more. We are ready for the final days of endless watches and the constant surprises we are gifted only at sea. However, we are also sad. We are not ready to say goodbye to our new home and new family, as it seems that our time here has begun to rapidly fall out of reach. We have to be thankful for our last days here, rain or shine. I am thankful for all this experience has given me. Only twelve more days. Well today was quite a wet day. Contrary to popular belief, this was not a bad thing. At 03:30 this morning it started to rain, but it wasn’t that bad because we only had half an hour left of watch, and the rain water was quite temperate. I quickly crawled into bed after watch and slept till 08:00 when I got out of bed for some really delicious pancakes that Brandon made. It was still raining during breakfast, but not too hard, and that didn’t stop me from jumping right back into bed for a Roseway-after-breakfast-nap. I slept from 08:45 until 09:45 when I was woken up for navigation class on calculating local apparent noon with Cap. Class kind of hurt my brain, but since it was the second time I had learned it, it was starting to make more sense. We finished at 11:00, and my watch had lunch at 11:25, so no napping before watch:( Watch was weird because the weather was very off and on. When we started watch it was really hot, humid, and sunny, then it poured and the wind picked up, and we had history class in the rain which was very fun. It cleared up by the end of class, but we headed through another squall soon after. PJ, Janelle, Tim and I were sent out to furl the jib because the wind picked up quite a bit. 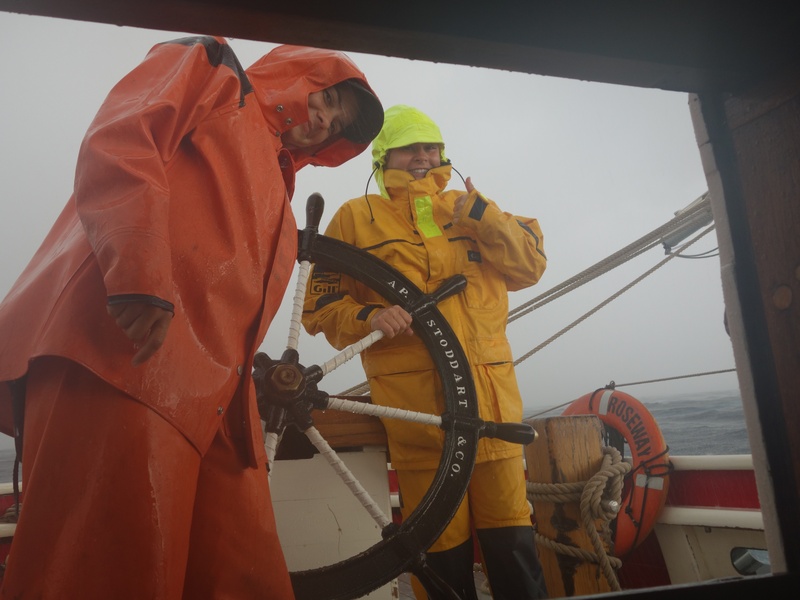 At first, because it was so windy, we could not reach the sail, but a swell allowed the jib to flop towards us, Janelle grabbed a piece, and we started to furl. We quickly sea stowed the sail, and it looked horrendous. As we sailed into the squall the swells were getting larger and larger. 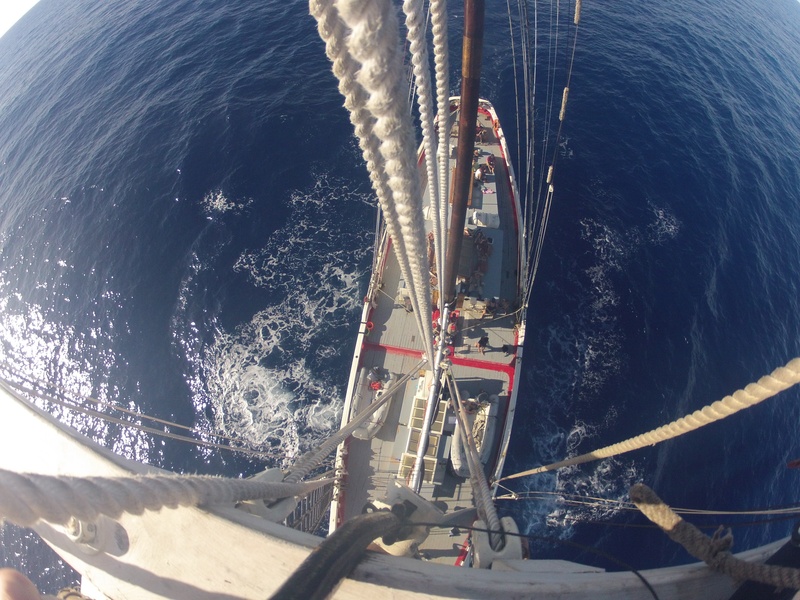 The bowsprit bobbed up and down, and as I looked down we were twenty feet above the water and then the bowsprit dove downward, and my right foot dragged along the surface of the water. We went up again, twenty feet, and plunged towards the water again, this time soaking us up to our knees. My vans were dripping, but it was totally worth it. We had dinner and a calm watch from 20:00 to 00:00, and now, I’m absolutely exhausted and ready for a good night’s sleep. Today is a long day for B watch. This is because we had all our four hour watches today. We started the day out with our 00:00 to 04:00 watch and continued the day with our 12:00 to 16:00 watch. It was a very productive day. In addition to having watch, we also had a history class on “the superstition on board” topic. It was quite interesting and we went over a lot of the terms that were invented on board that we use in our everyday life. Since we are just beginning our long voyage, everyone is still taking a while to get used to the tough environment. We are still figuring out things like the trash system, and a lot of us are trying to not get sea sick. I am looking forward most to going home!!! This is an overly dramatic illustration of me getting struck by lightning, drawn by Tommy Carey. I’ll get into that later. Today started with a wake-up at 07:15, for early breakfast because of our watch from 8 to 12. Neal, Tommy, and I scurried up the fish steps and were treated to a breakfast of pancakes from Brandon. I was JWO for this watch, and I mustered everyone and gave them the rundown of what we needed to get done. For chores, we had breakfast clean-up, deck-wash, and lunch set-up, and it was a busy watch. It also remained a pretty good temperature throughout watch, and it was a little hot, but that’s okay. We had Lit class first, and Matthew led us in shanty-singing before he gave us time to work on our short stories. My class ended at 11:00, and we still needed to set up lunch. We got it done quickly, and we were relieved at 12:00. Brandon made us noodle soup with vegetables, which was excellent. During lunch, Tommy, Neal, Janelle, myself, and a bunch of other people decided to take bucket showers after we ate, because it gets stuffy in the salon when it is hot, and we were all feeling sweaty and gross. I ran down to the fish after I ate and changed into my bathing suit, grabbed my towel and shampoo, and went back on deck. People were already dousing themselves in salt water when I arrived, and it took a minute for a bucket to open up. When one finally did free up, I filled it with ocean water, lifted it above my head, and dumped it all over myself. This was my first bucket shower, and the water was very refreshing. It took a few dumps of the bucket to wash off all the grime, and it felt very nice. We passed under a squall, and it brought rain, which acted like a freshwater rinse. We dried off and I later saw Tim, Eric, Tommy and Neal with a long pipe with a net at the wend, catching sargassum seaweed for Bio class. I joined in, and manned the net. We caught the seaweed as it floated by, and we got much seaweed for class, which was in a few minutes. In class, Ali talked about the ecosystems this floating seaweed houses, and how to identify different types of the sargassum seaweed. After class ended, we decided to take down the mainsail. I was first positioned on the quarter tackles, and after we took up on them, we struck and furled the main. 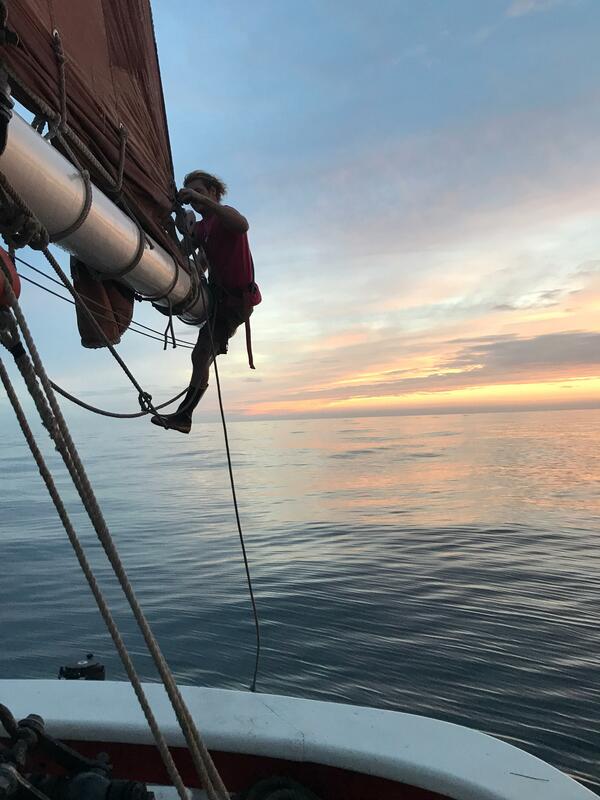 I was told to stand on the helm box to furl the mainsail, so I hopped right up. I had a hard time at first because the box was slippery, and easy to slip on. I settled in, and when I reached over to grab the end of the sail-tie, I saw a super-bright ball of light shoot to my elbow as I was reaching up. This light led to a loud snap and the sensation of being shocked by a metal object, but multiplied by about 50- pretty wild! My first thought was that lightning hit one of the masts, but everyone would have been struck also. Everyone looked fine, and after doing a self-evaluation I got back to furling the sail. Ryan was the only one who saw me get struck, and we were both in disbelief. It was CRAZY! I felt completely fine afterward, which I thought was interesting and lucky. After that ordeal was over, I went to the salon to work on my children’s book for marine bio with PJ and she drew some amazing illustrations of sharks, whales, and some tuna, among others. I got permission to go on the head-rig with Tommy, Alex, and Neal, and we chilled for a while and took in the beautiful sunset. B-watch had early dinner, and we had tacos with beef, cheese, beans, tomato, and cabbage. So good. We had watch shortly after we ate dinner, and this time it went from 1800-2000. Tommy was JWO, and he put me on helm for the first hour, and then forward lookout for the last 30 minutes. We did a good job getting the dishes and pans cleaned, and we made quick work of the chores. We were relieved at 20:00 by C-watch, and I am going to bed soon. We are probably somewhere between 7 or 8 days away from St. Croix, which is sad because the voyage is ending very soon. So far I am more than content with my time on the boat, and we’ll see what tomorrow brings. A journey like Ocean Classroom gives a lot of new experiences to everyone on board. 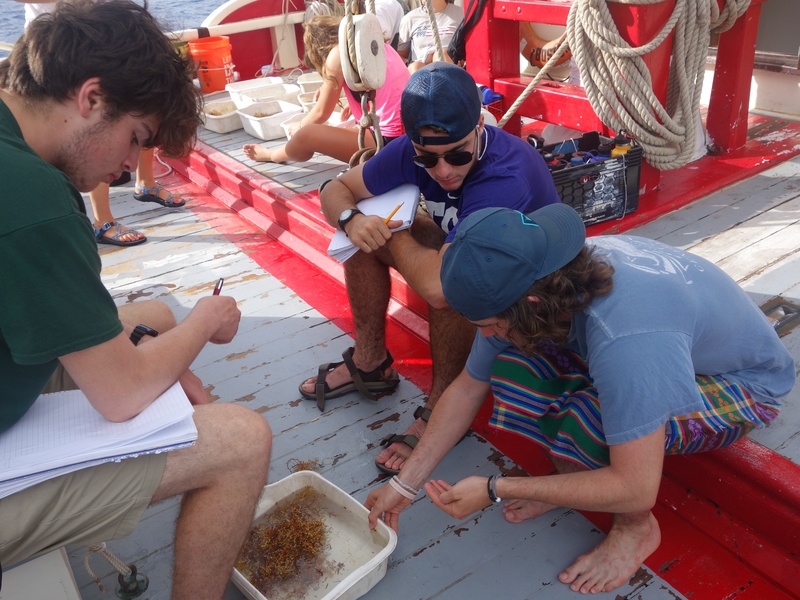 On the surface it might seem that the crew does all the teaching and the students do all the learning, but really we’ve all learned a lot from each other and the voyage overall. As a watch-leading team, we’ve taught the students plenty about how to handle the Roseway (hopefully this has been clear from the other entries). We’ve taught about chores, thorough boat checks, and good wake-ups (not sure if that one stuck, but it’s okay). Pins, knots, sail theory, tacking, gybing.. We’ve tried to transfer all of this knowledge to the students. 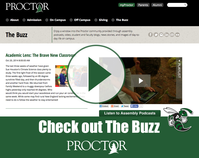 Ben’s shared his passions of boat building and woodworking; Krystina’s pretended to know about simple machines and the rules of ultimate Frisbee, and Ms. Leighton has held a number of sessions on Star Wars theory and song. We’ve covered making ditty bags and calculating local apparent noon. I think we’ve taught at least another thing or two, but the jury’s still out on that. As professional crew, this isn’t our first voyage, but anytime you sail with new shipmates you can learn different things. The students of Ocean Classroom 2018 have taught us how quickly twenty people can empty out a candy aisle and what the worst of a sugar crash looks like (RIP Gloucester). 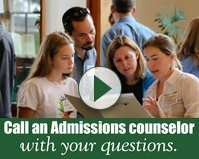 They’ve taught us about siblings, friends, and what its like to go to boarding school. Also, way too much about Eastern skiing. We’ve learned how flexible you can get as hockey goalie or a former cheerleader, and how to do a Rubik’s cube. They’ve taught us about Kahoot, all the ports, and the interesting things that happen when you try to interview people on the street. We’ve learned how quickly you can throw together an almanac, and several new ways to make yourself yuke. Inspirational, ah youth. This voyage has taught all of us together. What to do when the peril band on the main gaff breaks. How sometimes you end up going northeast when you’ve been steering southeast for a day (hello Savannah). That you might complain about the cold one day and the heat the next. We’ve learned how fast you can go through a gallon of New Hampshire maple syrup. We’ve discovered the best places to hide at three in the morning while wearing a panda mask, and how easy it can be to do some good spooking. We’re relearned over and over again why distance is measured in nautical miles and not days, and how sometimes the destination can feel further away than it did yesterday. Roseway, bound for St. Croix, Do or Die. Today was another day more amazing than can be adequately captured in words. I was barefoot on deck with the sun in my eyes and wind in my sea salted hair. I went out on the bow sprit for a time. Out there, you could see for ages. I sat with my bare feet dangling above the bluest water as the boat bounced up and down with the swells. The air was not, but it was windy so the temperature could not have been more perfect. I was unable to stop smiling literally incapable. My cheeks started hurting and I almost kept breaking out into either laughter fits or tears. I breathed in the whole world. I was so happy. I am so happy. It is unreal, the ocean. 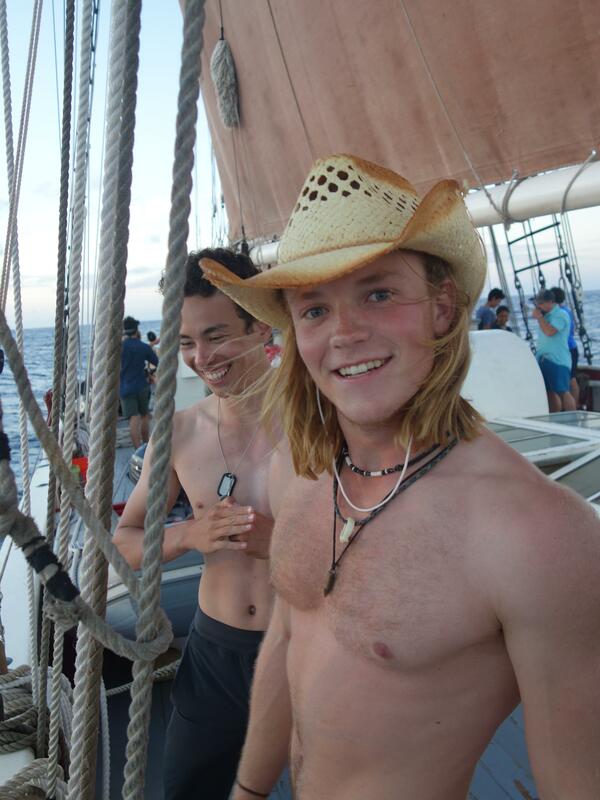 The warm Caribbean breeze hit me when I stepped on deck for the fifth day at sea. The bright blue water stretches on far as the eye can see in every direction. We are the only sign of life, other than the mahi mahi that was caught this morning by Renny. The fish tasted delicious when Branden cooked it up this morning right after breakfast. My 12-4 watch was going great and then a bucket fell into the water which resulted in us rescuing it in a man overboard drill. The sunset tonight was absolutely gorgeous. What an incredible day! The air was hot, but a nice cool breeze flowed through on deck. Unfortunately, not enough to sail but nonetheless amazing. 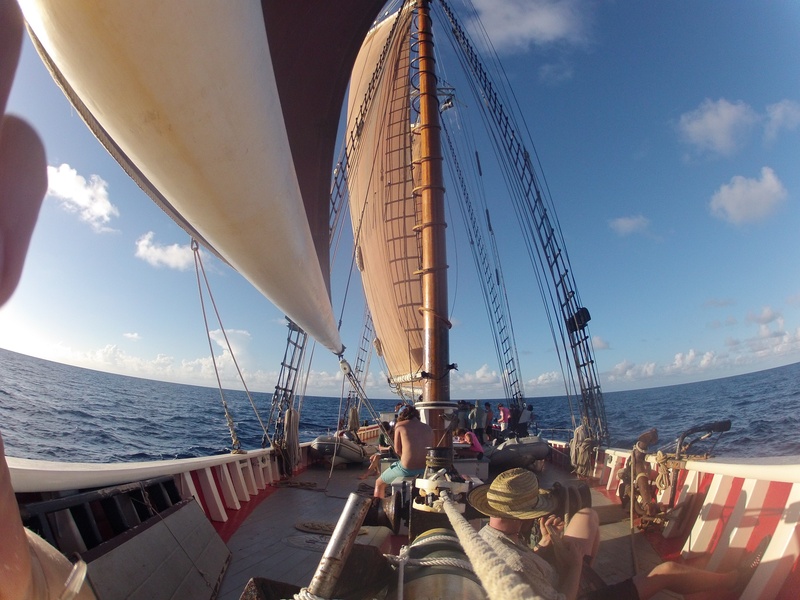 We had the afternoon watch and a treat of a class on Polynesian voyaging taught by Kristina, one of our deckhands. It was so interesting to learn about the way some people voyaged in the past. After watch, we had almanacs which is a time of day when we present weather, navigation, and engineering. Then we had an amazing dinner of chicken from our incredible chef Brandon! Overall, another incredible day at sea. Something that develops in a small community, like the Roseway, is an abundance of inside jokes. And with on abundance of inside jokes comes the worry that we will only be funny to each other, with no one else knowing what the hell’s going on. But that is what also makes them special. Just the thought that you and a couple of friends know what is going on. Aboard we have developed many inside jokes between watches, friends, and crew. I hope that when our voyage is done we are able to keep the jokes going even off the boat. 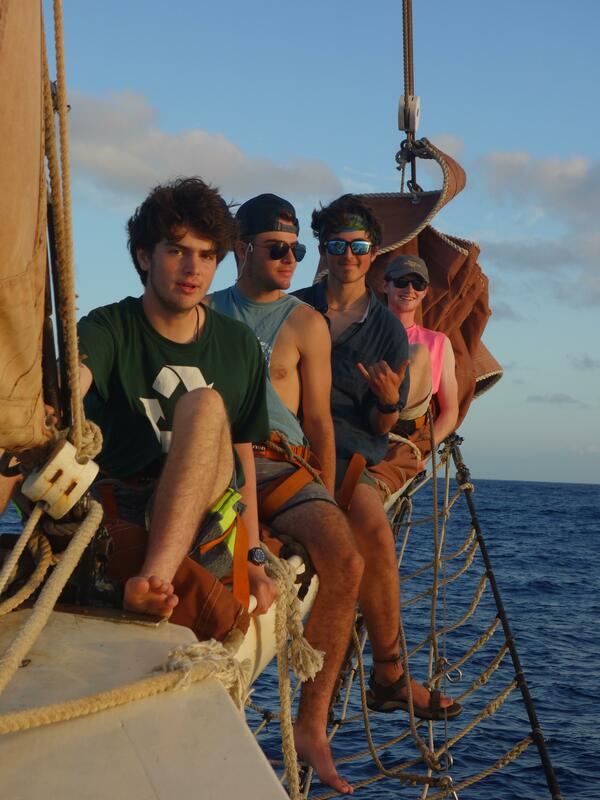 As we sail out our last days on Ocean Classroom 2018, I am interested to see how our interactions with friends, family, and classmates will change. For many of us, our growth has become so habitual and second-nature that we haven’t noticed our own changes in lifestyle and character. First off, our re-adjustment to flush toilets will be a challenge most awkward. So much so I see myself flushing 25 times every go. On a slightly more wholesome note, our work ethic and eagerness to contribute hands to work has definitely improved. 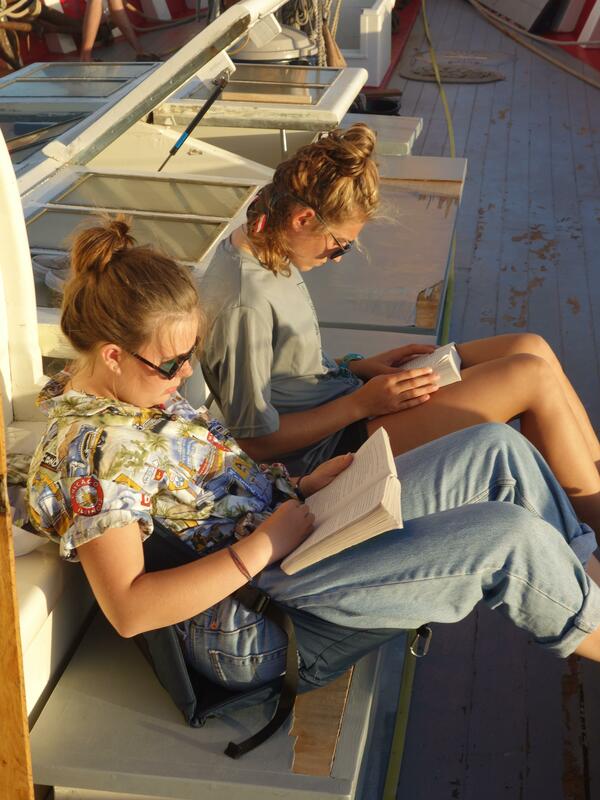 No matter our previous lifestyle, the call of duty aboard the Roseway helped us develop great skills and grit. Despite me dreading the end of our time aboard, I am interested to see our transformation. P.S.- To hear all of our stories, find the “Mindful Scoops Podcast” this winter with Steve, Johnny, and me! Now see here! Here we are on the Schooner Roseway. The year is 2018. Today was a day of many great excitements. It started off as your average swashbuckling day at sea. Mostly swash, just a little bit of buckle. B-watch sat laughing near the quarter deck, telling jokes and feeling jolly. Suddenly, and without warning, a wave hopped up over the cap-rail, drenching us from head to toe. At the exact same moment, the sound of an almighty rip rent the air. To our horror and general astonishment, our heads whipped around to find a tear eight-no!- ten feet in length running straight up the leech of our mainsail. What a pickle it was. What a large, salty, green pickle indeed. The situation looked dire. Fortunately for everyone on board, B-watch laughs in the face of danger. They don’t call us Fisty-Cakes for nothing. (As a matter of fact, very few people call us Fisty-Cakes). We sprang as one into action. B-watch seamlessly split into teams, ready to take control amidst the mayhem. Faster than you can say Poseidon, hands went to the main peak, throat, sheet, and down-halls. With no little effort, and a line of fearless furlers, the sail came down. The situation was under control, for now. But we were not out of the woods yet. 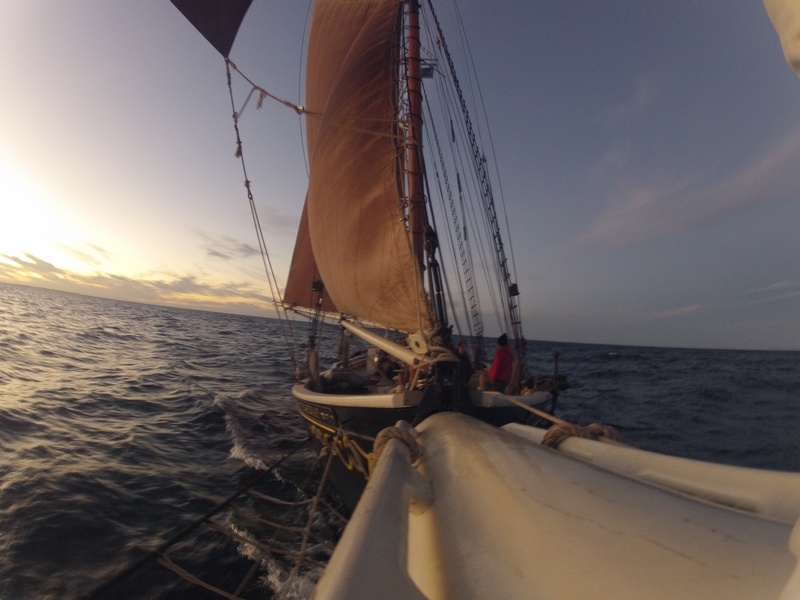 Now we found ourselves stranded in the middle of the ocean, quite without a mainsail. We were rapidly losing speed. What was to become of the once-great Schooner Roseway? How would we ever make it to our destination in time? Who could possibly step up and save the day? Well of course, dear reader, it was B-watch! Within half an hour the sail was unbent and lowered to the cabin house- its final resting place. It was a solemn moment, seeing our old main sail retired at last. We knew that our new mainsail had many flaws, but we had no choice. Our incomparable deckhand, Holly Buresh stepped up to the plate. Even though B-watch had been stood down, she worked tirelessly for two hours alongside Tim and Eric bending on our mainsail. It was thankless work, but by the time dinner rolled around, our mainsail was set. Meanwhile, our other deckhand, the no-less incomparable Karen Rose, had a delightful afternoon nap. It was well-deserved, after all the bilge-pumping action she had seen that day. Our journey has been nothing short of incredible. We’ve seen each other at our highest, our lowest, and everywhere in between, thus allowing us to bond and grow as a near perfectly cohesive unit. I have learned to love each and every one of my watch-mates for who I see them as: both their strengths and their observable flaws. Thank you for everything that you have given me on this journey. Thank you for making me what I have become, and building alongside me the best team that I have ever been a part of. I love you all now and forever. This journey never had a dull moment, all thanks to A watch. From the birth of our watch at Camp Kenwood, to freezing our butts off in Castine, Maine, to dancing our lives away in Norfolk, Virginia and to eventually ending our journey at my home (Puerto Rico). This watch has been through it all. This watch will forever be family and I’ll always refer to you guys as brothers and sisters. Thank you for making our trip worth wild. Our lucky six, this may be the last of the trip, but it would be the start of something new. Since we all have each other. I will forever cherish this journey and you guys will forever be a part of my heart. Love you A-watch. Let me tell you, I can confidently say I have definitely found a home away from home. These people have never failed to put a smile on my face, or make me laugh so hard that my belly hurts. I am so happy to have been a part of A-watch. It left me with crazy stories and unforgettable memories. Thank you endlessly for everything. Love yall always! When we first split up to cook a pasta dinner at Camp Kenwood I was far from confident in the strangers I had been put with. But now, there is no one I would replace. You guys kept me sane, by just going through the same long night watches and relentless Galley cleanups. Although we may not be the biggest, strongest, or fastest watch but we sure as heck know how to have a good time. Remember, we’re always on watch even when we’re not. Love yall to Puerto Rico and back! It seems like forever ago that we were building rafts at hurricane island, watching in disappointment as our raft dismantled before even touching the water. Since then, I’ve been able to share some crazy experiences with a group that I can proudly say is my family aboard Roseway. Though at times, this group has driven me crazy, I know they will always support me. Thanks for making this journey such a memorable one. “B-watch” was an experiment of sorts that Proctor tested. What would happen if you take the seven hardest working and fun members of the student crew and put them in one watch? They then took this elite lineup and paired them with the best and hardest working deckhands and mate. It was a Seal Team 6 of seamanship. Frank, or considerate Frank, was a true sailor. The first to be aloft cleared, she carried B-watch miles ahead of the other watches. A true navigator, Frank could always fix the poor chart markings that were left by the previous watch. Tommy brought many horrible jokes, as well as some dad style. He was at navigation pretty much every watch, and he got pretty good in the process. Not as good as Frank though. The work assigned to Tommy (usually) gets done, and he is a hard worker. He is a great leader, and we all love him. Hopefully he changes this style. Steve, the most charming man in the world, was the hero of the group. He would follow orders without any hesitation of complaints and would get the job done. His struggles at JWO were made up for by his incredible charisma. Steve can do no wrong. Neal, the unsung hero of the group was an essential member of the team. He struggled with sea sickness, but never let it get in the way of work as he mastered the boot-n-rally early on. He would take the blame for a lot of things so his other shipmates could shine. PJ was an all-star. When she would haul on lines, a foot of slack would be taken to the pin every time. Her positive energy was always appreciated, especially during the 12-4 watch. Janelle always got her stuff done, and legend has it that she could clean everything in the galley in five minutes. She always knew everything that we had to do, and she always went on the head-rig to take in the jib when people didn’t want to. Van was sometimes unmotivated, but feed her a few Oreos and chores will be done within 10 minutes. Van was the greatest helmsman- she once sailed though an intense squall and never once veered a single degree off course. Holly and Karen were the best of deckhands. Holly would motivate us with her constant enthusiasm and Karen with her sarcasm. They helped us work like a well oiled machine. Ms. Ordway was the greatest mate, her no nonsense attitude and wealth of knowledge led B-watch to become great seamen. C-watch, you should know, was the greatest watch on the ship. Made up of Ryan, Cat, Alex, Johnny, Mackenzie, Nikki and Renny, it was unbeatable. We ate many snacks, and that’s about it. But also, we slayed watch-life. C stands for champion. Ryan could be heard from anywhere with his extraordinary laugh/bellow/loud noise when on watch. Miss Young did not approve. Cat’s moment of glory was when she murdered the captain and was then proposed to. Alex was the unsung hero of the watch. He crushed those chores. It should also be known that he slays the yo-yo game. And the Great sharer. Johnny two pants was provider of great entertainment and fine music. Such as the chart-topping Record “Snack-Time” Goodpasture… Moonwalk. Machenzie “#yourmom” Nikki, blinking star, state trooper, mango! 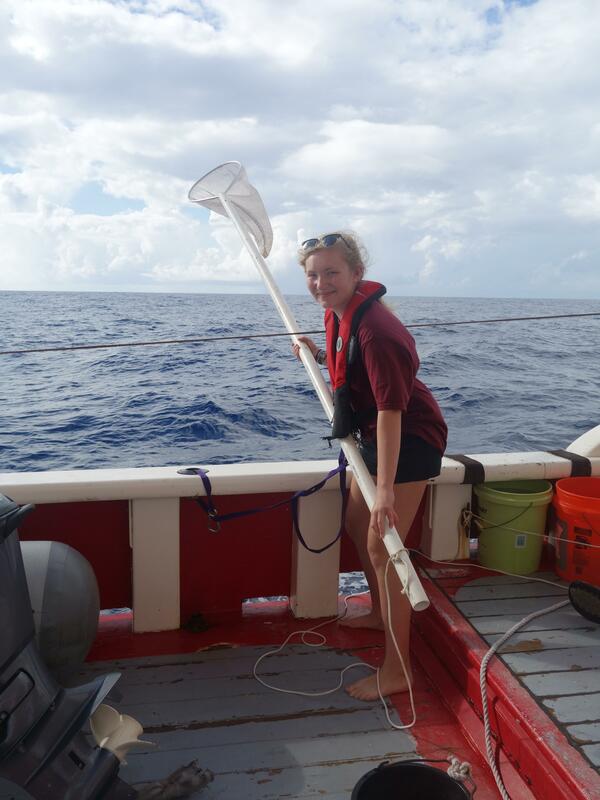 Glass doors, fish waste, last to muster, ah… Renny- curtains 1-4 & constant navigator.